Despite being just the size of an insect, tiny military weapons being developed by the military have the incredible power of hundreds of tons of TNT. In a new book, Louis del Monte, a physicist from Minnesora warns that these tiny weapons - dubbed 'nanoweapons' - could lead to the most destructive world war yet which could spell the end for humanity. And this isn't just a long-term worry, as Mr del Monte has warned that the tiny weapons could render humans extinct by the end of the century. Nanoweapons have a 1 in 20 chance of causing human extinction by the end of this century. Terrorists could get their hands on nanoweapons through the black market as early as 2020. They could be programmed to perform such tasks as poisoning people and contaminating food and water supplies. The US, Russia and China are all currently investing billions in research in nanotechnology. Mr del Monte believes that the advancement of nanotechnology could be even more dangerous than conventional nuclear weapons. The US, Russia and China are all currently investing billions in research, according to his book 'Nanoweapons: A Growing Threat To Humanity' which is published by the University of Nebraska Press. This technology, which could create insect-sized lethal weapons, will incite world governments to compete in the deadliest arms race ever, Mr del Monte says. 'Nanoweapons are the most likely military weapons to render humanity extinct in this century', he writes. Nanoweapons are smaller than a strand of hair and insect-like robots could be programmed to perform terrifying tasks such as poisoning people and contaminating food and water supplies, according to CNBC. A five pound (2.3 kilogram) weapon - which could be concealed in something as small as a wallet - could be used to blow up a whole building. He also predicts the rise of nanobots - nanosized killer robots which are made from nanotechnology - whose size makes them particularly hard to detect. Nanotechnology refers to technology that is measured using a nanoscale. To put this in context a single nanometer is approximately ten times smaller than the width of a piece of DNA. 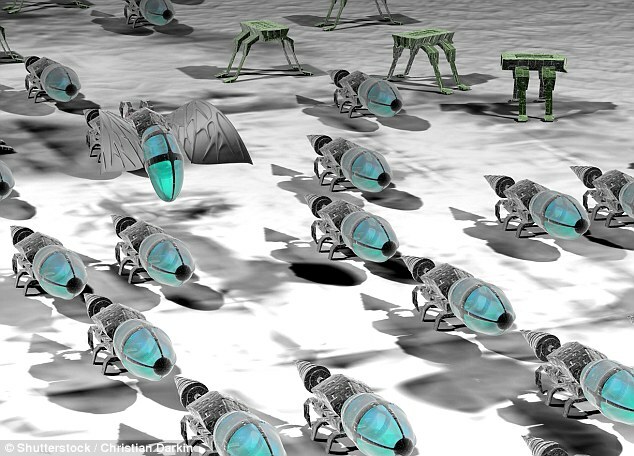 Using this technology, experts can create tiny nanoweapons weapons as small as insects. These will dominate twenty-first century warfare, according to Del Monte's shocking book. Mr del Monte also predicts that terrorists will get their hands on nanoweapons in the next three years through the black market. 'The events that most people consider likely to cause humanity’s extinction, such as a large asteroid impact or a super-volcanic eruption, actually have a relatively low probability of occurring, in the order of one in 50,000 or less', Mr del Monte writes. This prediction was first made in 2008 by experts at the Global Catastrophic Risk Conference at the University of Oxford who said molecular nanotechnology was the one of the most likely ways that humans would be exterminated. 'The superpowers of the future will be those nations with the most capable nanoweapons', he claims.